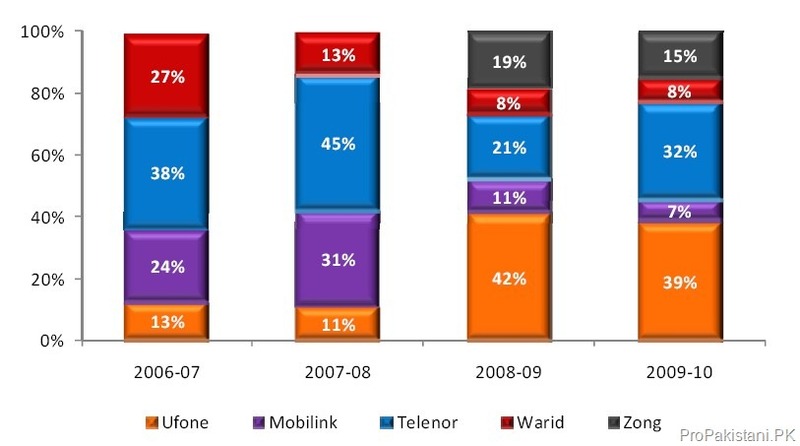 Pakistan’s Cellular industry faced tough fiscal year 2009-2010. Hiked pricing, lower buying power, power crisis, currency devaluation and price war remained major strikers for the cellular companies in year 2009-2010. Objective of this report is to analyze the industry’s growth & performance of individual players. Companies may benchmark their next year’s strategy on the basis of Network KPIs given in Section 4 of this report. In comparison to 17% revenue growth in FYE 2009, overall industry revenue growth slowed down to 11% in FYE 2010. Following graph shows the contribution of individual cellular players in the revenue growth. During FYE 2010, 39% of increased industry revenue was picked by Ufone, followed by 32% by Telenor & 15% by Zong. Warid & Mobilink’s share in the increased industry revenue remained less than average industry growth rate of 11%. Warid & Mobilink continued to lose. 2,000+ sites were rolled‐out during the fiscal year 2009-2010. Ufone & Zong continued to aggressively roll‐out network (Ufone added 820 sites, Zong added 760 sites) during FYE 2010. Warid’s network roll‐out remained on‐hold (added 78 sites during the year). Industry Revenue/avg. cell site dropped from PKR 8.6m in FYE 2009 to PKR 8.1m in FYE 2010. Following table shows that Mobilink topped network utilization in terms of revenue generation with PKR 10.7m per site, followed by Ufone & Telenor at PKR 9.3m per site. In comparison to network size, revenue market share of Mobilink, Ufone & Telenor is higher than network share, while Warid & Zong remained on lower side in terms of revenue share. Industry’s growth is slowing down over the period of time, which means that new subscribers’ addition is reducing and future competition will be focused more towards launch of innovative products/services to increase revenue streams. Subscribers’ retention & acquisition of subscribers is already on the top of to-do lists, along-with, customer support is going to play pivotal role in coming days. Marketing plays its role: both Ufone and telenor have registered their success through better marketing practices. Based on comments, I think companies need to fired all expensive sales employees and do focuss for services like JSP promote by Mobilink under the leadership of IA. “This means that new subscribers’ addition is reducing and future competition will be focused more towards launch of innovative products / services to increase revenue streams”. To substantially increase revenues from existing customer base and also to attract more new customers, these companies have to think innovatively. So far the focus of these companies seems to be dancing girls and funny advertisements and continuing price reductions. That has hit the diminishing returns. These companies have to launch innovative services including MMS services, which will differentiate them. For such services customers will be willing to subscribe and pay. That is the challenge now. Tony you are right to some extent, however I feel that revenue increase and industry growth requires overall improvement in economy! In my professional career, I have seen this number of times that when revenues are increasing then marketing and sales takes full credit. However, when revenues are down most marketing and sales people blame it on floods, or earthquake, or political situation, or the economy, etc. etc. However, there are few who become even more creative in the face of challenges. • Because of competition and price erosion operators are facing ever declining ARPU. • Exchange of content directly between content providers and the handset takes the operators out of the value chain. • Operators are losing revenue as their network becomes a channel for content delivery. • Web applications are enjoying immense success by providing incentives to their users (free email, video portal, social MM sharing) and by matching user segments with finely targeted advertising. To address above issues and increase revenues, Pakistani Celcos and Telcos do not have to reinvent the wheel. They can review how effectively SMART (and many others) is using multimedia platform to generate additional revenues. Perhaps ProPakistani can publish more information on the mobile multimedia platform used by SMART. For the information of ProPakistani readers, it is called Mercury Mobile Multimedia Platform. I agree, new services should be launched. But let me highlight the impact of economy. Consumer spending patterns/wallet size are always affected by the changing economic conditions. Generally it has been observed all over the globe that price reduction doesn’t impact the consumer wallet size. Any price erosion is compensated by the increase in usage. Reason for declining average ARPU in Pakistan is the roll-out of network & acquisition of subscribers from the rural areas (low earning group) with low ARPUs. Ufone is comparatively better than all other companies according to these statistics. Mobilink is going down day by day and no growth for Zong yet for this year. Warid hasn’t any attractive package to help them out in revenue building or to increase market share. I agree with Tony, these operators will have to come up with more creativity & innovative ideas. However, I see Telenor doing much better than others, it has offered Financial Serivices, Value Added Service through retail outlets, Customer services at remote locations. Lets see (& hope) others will come up with more attractive ideas. I am a student, i have got an assignment of business analysis, in which i have to discuss about the two successful telecommunication companies in pakistan. can you please help me like the name of two successful telecom companies of pakistan and why they are? I think now in pakistan two successful compenies are telenor and ufone. i know they are working well but if you go through revenue, market share and subscribers mobilinks stays on 1st position and telenor comes on 2nd.